Chris Impellitteri, supposedly the world's fastest guitar player, tries very hard again on the new album, and despite the silliest cover artwork ever, Pedal To The Metal convinces rather well. Graham Bonnett is no longer the vocalist, but the more aggressive voice of newcomer Curtis Skelton does the album justice. Unlike most guitar heroes, Impellitteri focuses on the song and not so much on the solo, making his music accessible for all metal fans. Of course, he likes to let some arpeggios flow into his versatile rhythm work, just to show you who's your daddy, but the fact alone that there are no instrumental tracks and no overlong suites present should be proof enough. The first couple of songs are an intelligent crossover of European neo-classical metal with traditional US speed metal, all done in a contemporary sound. The short and hyperfast Crushing Daze is something different, with lots of weird keyboards and a melodic chorus that could come from a Devin Townsend album. Another unusual song is the parody Punk, making fun of the current rap and hip hop craze. A very controversial track, but who said humour doesn't belong into metal? When it comes to the more classical songs, the highlights are The Kingdom Of Titus (Tribute) and Destruction. The lyrics are more well meaning this time, but still clumsy, and the short running time could have afforded one ore two more songs. The production is mostly good, except for the (rare) keyboards that are very uninspiring, done by a session musician who could have put more effort into his sound banks. 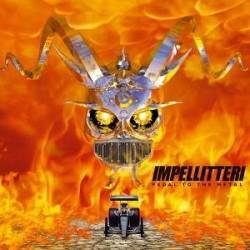 When compared to most neo-classical newcomer bands, Impellitteri is light years ahead, and although there are a few flaws on Pedal To The Metal, it is one of the really good classical (with an edge towards the contemporary) metal albums that deserves to be checked out.